There are several options for setting up the MLog system. 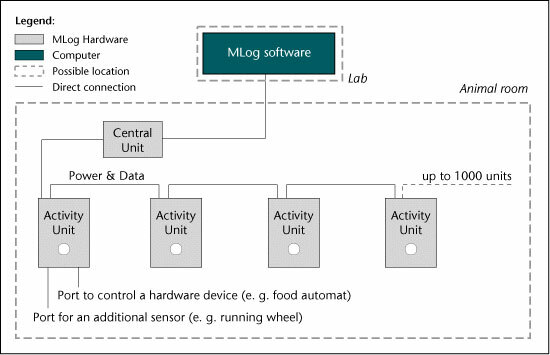 In the basic design option the MLog hardware (Activity Units and Central Unit) is installed in the animal room and the MLog software is installed on one computer that is directly connected with the Central Unit. To control the experiment or analyze the data one has to be present in the lab. 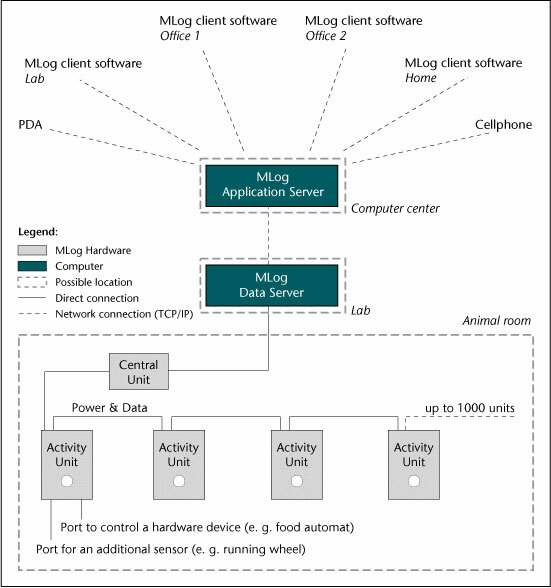 The advanced design of the MLog architecture runs the software on an application server. That allows control and observation of experiments from different computers at different locations. With this solution several experiments can be performed at the same time and several persons can use the system simultaneously. All MLog hardware is located in the animal room and the computer with the MLog software is connected directly to the Central Unit. One experiment can be perfomed at a time and only the computer that is directly connected to the Activity Units can control and analyze the experiment. The MLog hardware is installed as described previously. However the Central Unit is connected to the MLog Data Server, a computer, that is located near the animal room. This computer is connected via the Intra- or Internet with the MLog Application Server which manages all the configuration and data files*. With the MLog Client software, it is now possible to log onto the Application Server from any computer connected to the Intra- or Internet. You can control and analyze your experiments from multiple locations or you can, for example, observe an experiment live during a conference call. Even with a PDA or a cellphone you can control data acquisition. It is also possible to perform multiple experiments at the same time with this set up. *The MLog Data Server and the MLog Application Server can run on the same computer, too.